University of Illinois team members feel they've designed and built a marketable prototype—a "new solar" house that's attractive and comfortable, too. When the unpredictable Midwest climate interfered with building their house outdoors, the University of Illinois team simply built it in a warehouse. "We set up an assembly line, a rail system, to construct the home in three modules—we can roll modules out of the warehouse and onto the truck," says student Bob Kinsey. "We have demonstrated our ability to mass-produce these modules in a large-scale environment." The concept of modular design is not something new, but people may think of it as low quality. "This is not true for us," says architecture student Nora Wang. "We designed the building to be flexible, comfortable, and livable. And you can customize the interior space, which helps engage the user's imagination." When it comes to making the house comfortable and easy to live in, the team has this covered, too. "This area may be the most innovative element for us," says student Ben Barnes. Cooling and heating is all radiant via ceiling panels—no forced air is used. The team's approach to lighting was also carefully conceived. Placement of windows and doors for daylighting was designed in parallel with the artificial lighting plan. They are using dimmable fluorescent lights and LED bulbs for task lighting. "The LED was invented by a graduate and current professor at the University of Illinois, so we take great pride in using this technology," says student Susan McKenna. Every piece of furniture and cabinetry in the home is student-designed and customized with inhabitants' activities in mind. A local firm, which is headed by an Illinois alumnus, built the kitchen cabinets from 100% recycled particleboard. "Our industry contacts are excited to get their products out there. One of the greatest things is the way people have stepped up to the plate," says Wang. The team members feel certain that the modularity and flexibility of their design translates well to the consumer. 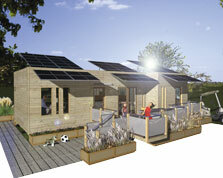 "This is about the affordability of a solar home for everyone. It's the Volkswagen of homes," says Kinsey.